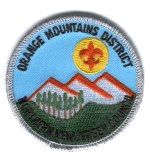 This year's Orange Mountains District dinner will be held at The Appian Way Restaurant, 619 Langdon Street, Orange, NJ (973-678-0313) from 6 PM to 9 PM on Sunday, April 6th, 2003. Come to celebrate with other volunteers. Share a delightful full-course Italian dinner in a comfortable setting. Highlights will include Door prizes, District Award of Merit, Silent auctions, Leader Awards, Veteran Awards and Scout Memorabilia.